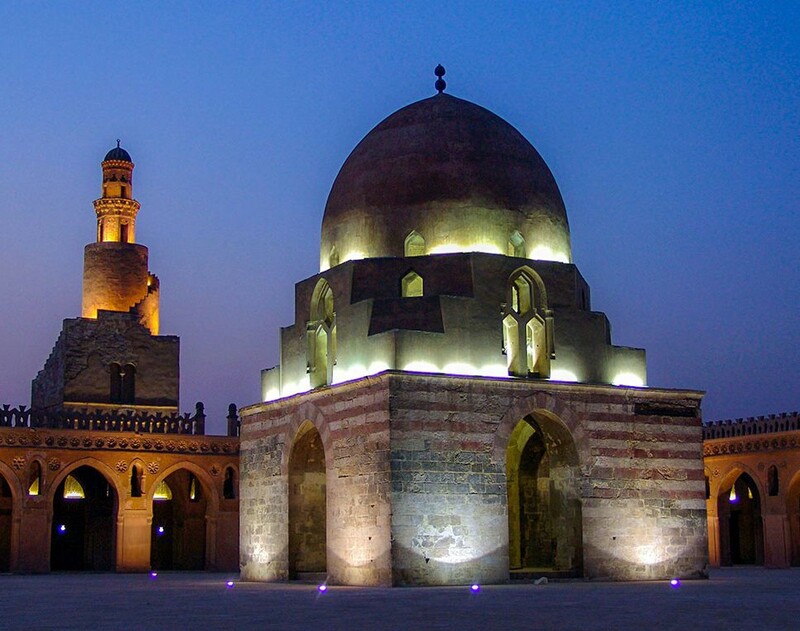 The Mosque of Ahmad Ibn Ţūlūn is located in Cairo, Egypt. 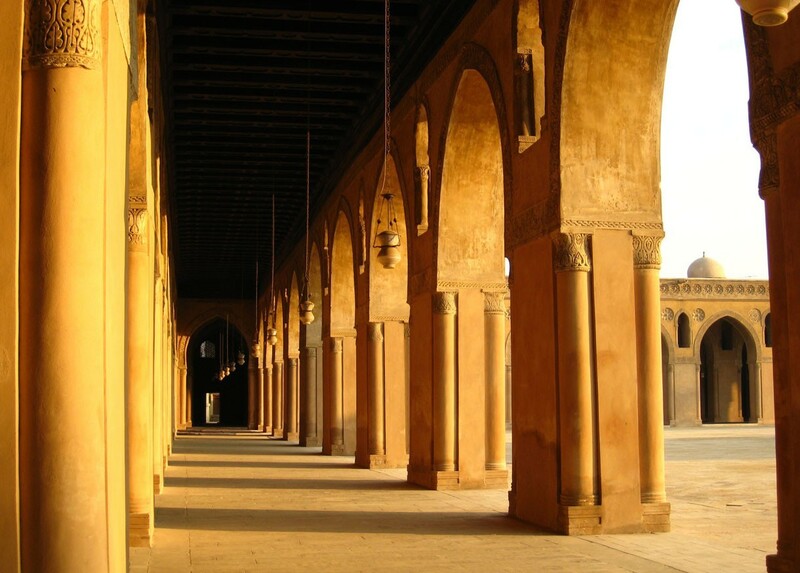 It is the largest mosque in Cairo in terms of land area and the oldest mosque in the city surviving in its original form. The historian al-Maqrizi lists the mosque’s construction started on 876 AD, and the mosque’s original inscription slab identifies the date of completion as 879 AD. The mosque was constructed on a small hill called Gebel Yashkur, “The Hill of Thanksgiving”. In local myth it says that it is here that Noah’s Ark came to rest after the Deluge, instead of at Mount Ararat. The mosque was constructed in the Samarran style common with Abbasid constructions. The original mosque had its ablution fountain in the area between the inner and outer walls. A distinctive sabil with a high drum dome was added in the central courtyard at the end of the thirteenth century by the Sultan Lajīn. 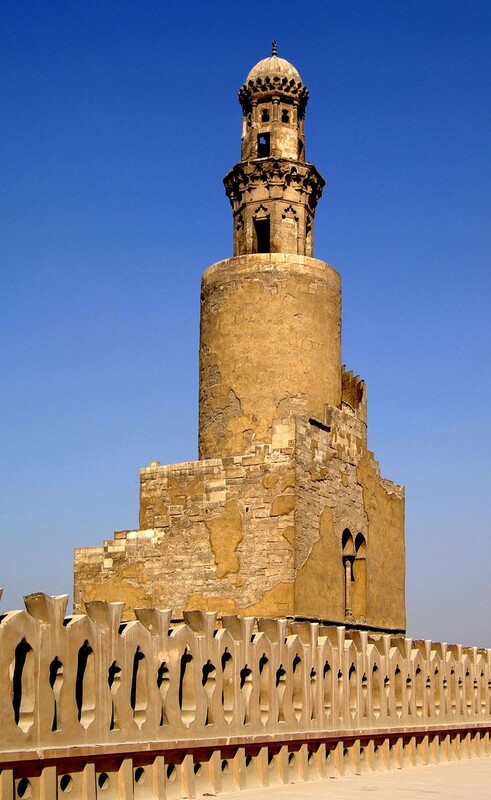 There is important controversy over the date of construction of the minaret, which features a helical outer staircase resembles to that of the famous minaret in Samarra. It is also told that using these stairs one can climb up on a horse. Many of the architectural features, however, point to a later construction, in particular the way in which the minaret does not connect well with the main mosque structure, something that would have been averted had the minaret and mosque been built at the same time. The first known restoration was in 1177 under orders of the Fatimid wazir Badr al-Jamālī, who left a second inscription slab on the mosque, which is noted for containing the Shi’a version of the shahada, adding the phrase “And Ali is the wali of God” after acknowledging the oneness of God and the prophet hood of Muhammad.